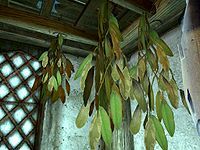 Elves Ear is harvested from branches of Dried Elves Ear that are found hanging to dry inside homes and other buildings, typically side by side with garlic and frost mirriam. It is not possible to harvest fresh elves ear directly from plants. Note that it is not related to Falmer ear, which actually comes from elves (specifically, Falmer). This page was last modified on 9 April 2018, at 04:08.